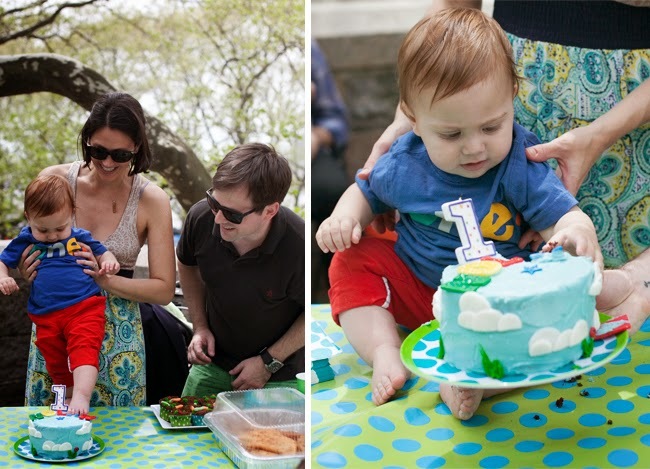 It's hard to believe our little man turned one last weekend! My husband and I decided to avoid all the bells-and-whistles that kids' parties seem to have these days and instead celebrated with a small crew at a very low-key party in the park. It's so tempting to go over-the-top for a first birthday party; Damn you Pinterest for making me feel like I need a DIY piñata and balloon animal station at my kids birthday! Sure, the "pre-baby" Seton would have opted for that DIY piñata, but a low-key party was the best decision we could have made. Time consuming planning and labor intensive party decor wouldn't have made the slightest difference in the amount of fun our guests (and our son) had. 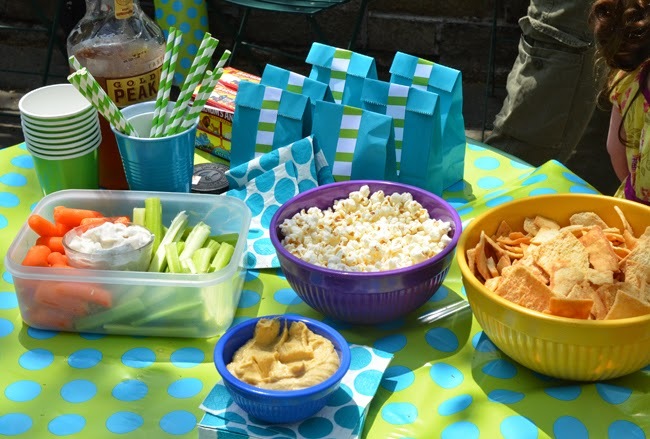 Instead, some simple decorations and menu choices kept this party fun and easy! 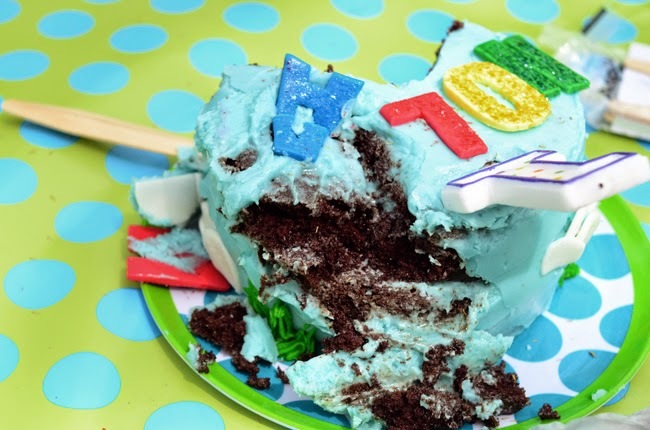 My advice to anyone celebrating their kids birthday...KEEP. IT. SIMPLE. THEME & DECOR: I kept it as simple as a color scheme. I chose blue and green to simulate sky and grass. 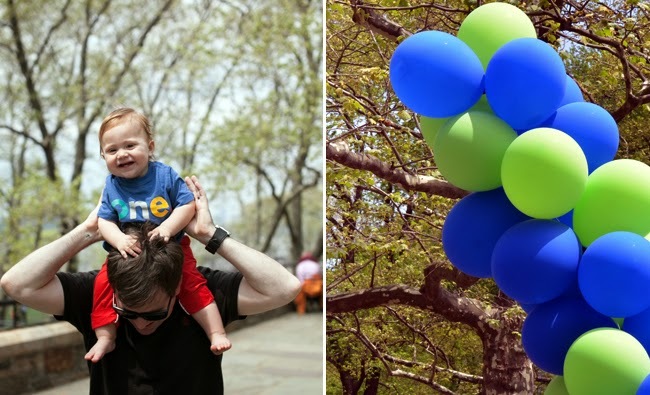 No big conceptual ideas here–It's a party in the park–so I decided to let the park drive the theme. I sent my husband down to grab a few tables in the park, then we covered them with a roll of blue/green wrapping paper I scored at HomeGoods (of course). 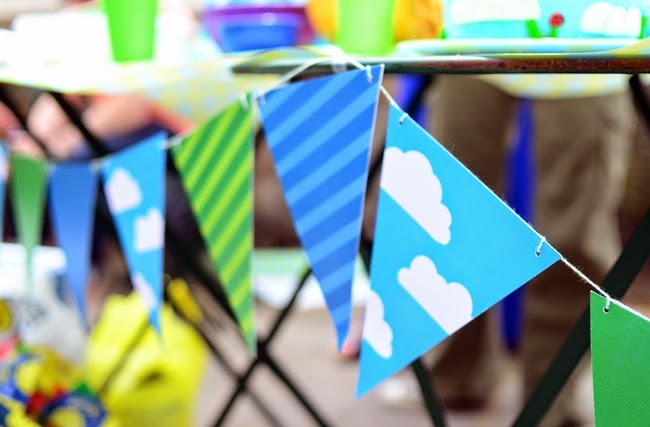 A sky and grass themed banner plus a mix match of polka dots and stripes in blue and green was just enough color to make things festive. FOOD: It was hot out and I had to carry everything from our apartment a few blocks into the park. This meant lots of lightweight and temperature stable foods. 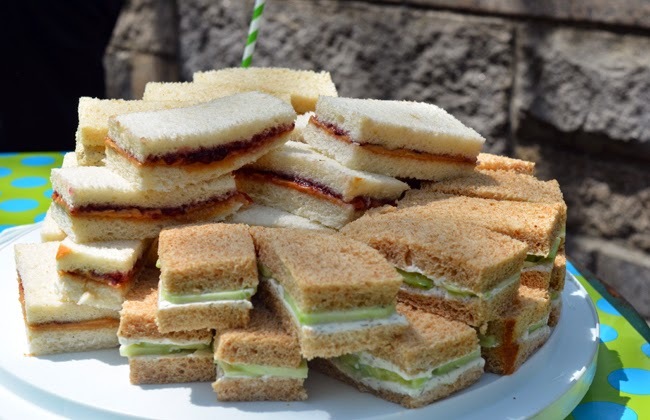 Finger sandwiches seemed to do the trick with PB&J, cucumber & dill, and chicken salad options. I also had prosciutto wrapped melon and some veggies with dip. 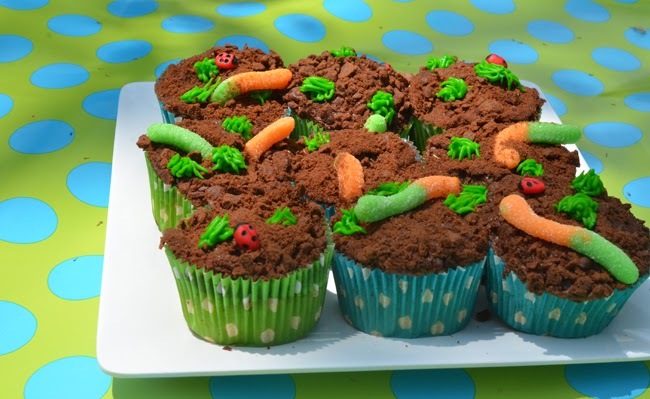 I made "dirt cupcakes" consisting of a vanilla cupcake topped with a simple chocolate buttercream, chocolate cookie crumbs and a gummy worm. I added a few sprouts of grass with a grass piping tip like this and some green buttercream. Because it was hot, I stuck with Arnold Palmers and lemonade. 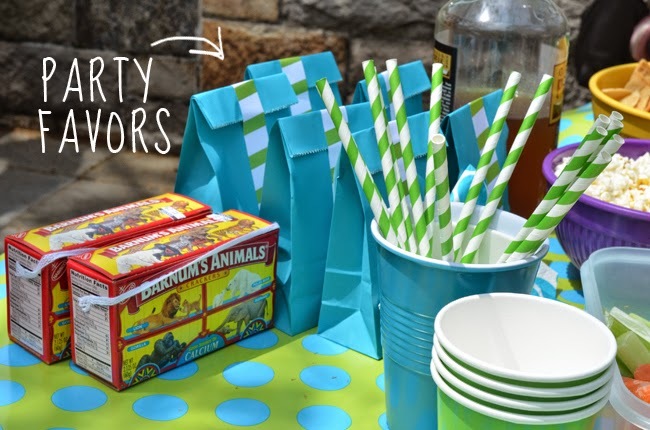 Favors were the typical assortment of crappy dollar store toys like noisemakers and goofy glasses, yay! Animal crackers are also easy for kids on the go. 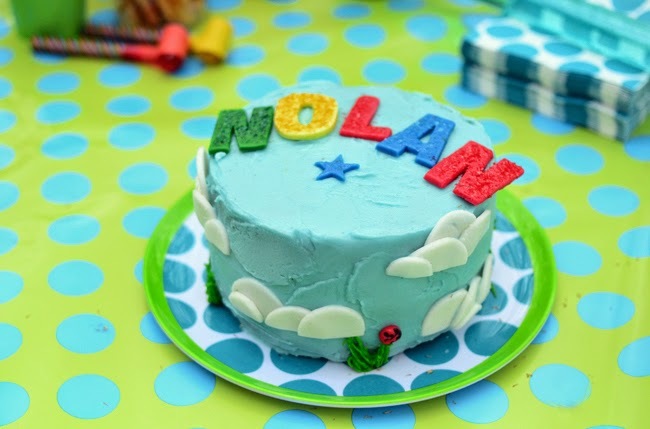 The "smash" cake was devils food, covered in sky blue buttercream frosting, fondant clouds and letters. Ah, the cake carnage.... Nolan put his foot in the cake, which made things exciting. And despite the gorgeous weather, towards the end it started to POUR! (I mean torrential downpour.) But we brought the party back to our apartment and I wouldn't have had it any other way. Keeping things simple meant very little clean-up or leftovers. 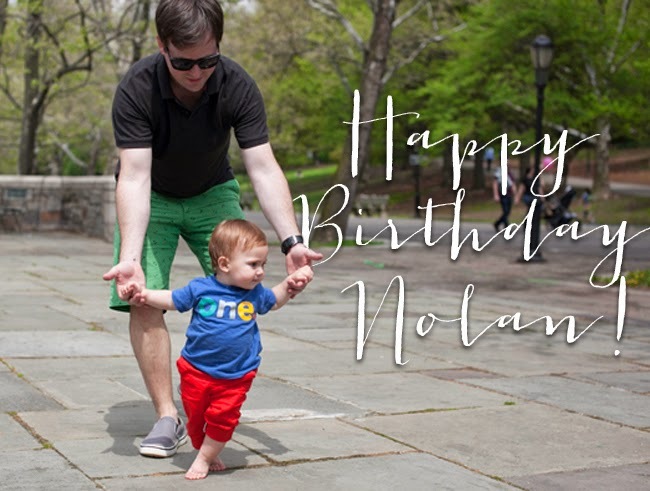 All-in-all, I kept my sanity and Nolan had his first handful of cake, introducing him to one of the best things in life. It was a good day. wow! very nice post. Happy birthday to u.That's great information. Thanks for sharing this blog. 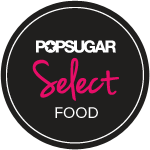 I did a search and found your blog and glowing review. It's been a big help! Thanx! Let this new year of your life be special, here full of precious moments, bright emotions, full of happiness and joy! Let Love follow your footsteps everywhere you go!!! HAPPY BIRTHDAY ! !